A short distance from Dhahran and the Saudi Aramco headquarters is the industrial port town and commercial hub of the Eastern Province, Al-Khobar. The municipality of Al-Khobar was founded in 1942, prompted by the discovery of oil and the ensuing development of commercial activity. The modern city of Al-Khobar is a flourishing center of international trade, with many examples of both contemporary Arabic and western architecture. Al-Khobar has developed to become one of the most beautiful cities in the Kingdom, with exceptional recreation and leisure facilities. 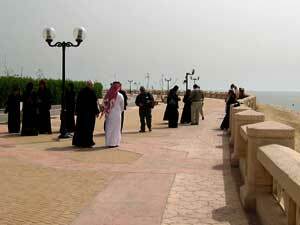 The King Fahad Coastal Town consists of gardens, amusement halls, zoological gardens, and manicured cornice. We walked on the cornice stopping to take photographs of the Arabian Gulf on one side of us and McDonalds on the other. Al-Khobar boasts tourist spots, entertainment centers, and a beautiful, widespread beach as well as first-class shopping catering to the needs of expatriates. Guests were given a tour of this commercial center and shopped for souvenirs at the beautiful new Desert Designs Store on Dhahran Street. Owners, Qamar Ahmed (Kim) and Farid Bukhari personally greeted their shoppers offering them tea and hospitality. Saudi gold merchants have made it their business to show off the world's most precious metal for its lustrous beauty, versatility, rarity and indestructibility. In the Gold Suq shop after shop of gold merchants line the street. Each shop is draped in gold, and offers only the highest quality (18-22 karat) and brilliant craftsmanship. Following a delightful lunch at the Carlton Al-Moaibed Hotel, guests departed to Dammam where we boarded one of Saudi Aramco’s 737 jets for a speedy trip to Shaybah. Shaybah oilfield resides in the Empty Quarter of Saudi Arabia. Set in the heart of Rub Al-Khali, the biggest sand desert in the world, Shaybah rests isolated among fields of tall, rust-colored sand dunes. Shaybah is remarkable in its man-made presence, awe-inspiring in its significance to the world oil market, and strangely beautiful considering it is said to be located in one of the most remote, desolate and inhospitable areas in Saudi Arabia. The largest oil development of the past twenty years, the Shaybah oilfield is capable of pumping half a million barrels of oil a day. It is located 250 miles from the nearest township. Thirty million cubic meters of sand were moved during its construction. 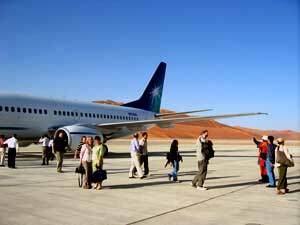 An airport capable of taking big jets, 500 miles of pipes, a new road across drifting sand dunes, and residential quarters for 750 workers, were all built in a little over 18 months. In 1998, Saudi Aramco completed an accelerated program to produce 500,000 barrels per day of high-value Arabian Extra Light crude oil from the remote Shaybah Field. Production from this large field, located 800 km southeast of Dhahran came on stream under budget and a year ahead of schedule. While at Shaybah, guests enjoyed a presentation on Shaybah History and watched an informative film, Shaybah Now Energy for the Millennium, showing the development of the oilfield and its daily operations. They were then driven up a very tall sand dune to a reception area which has been created in the form of an Arabian tent overlooking the Shaybah facility. From this higher viewpoint it was possible to appreciate the peace and serenity of the spectacular red desert and the magnificent views from the top of the dune were simply stunning. The delegation of teachers climbed to the top of the dune to watch a spectacular sunset over the sand dunes. It is said that, as the sun sets it creates the strangest effect, as though a thin, green gauze has been draped over the dunes. For a few minutes thoughts of oil are far away. After a wonderful dinner hosted by Mr. S. G. Al-Ghamdi, Manager, guests relaxed in the modern tent and were treated to a poetry reading by renowned Saudi poet, Nimah Ismail Nawwab. Accompanied by Jim Davidson at the guitar, Nimah began her reading with a poem mentioning the Empty Quarter, The Longing, and ending with a poem dedicated to our visiting teachers, Recipe for Knowledge. Jeanné Lohfink, one of our visiting teachers, expressed her feelings afterward. After a short night's rest, we were up early and on the bus to start the day and headed straight for Munira Al-Ashgar’s Gallery. While touring Dhahran, guests took a short bus ride to Ar-Rabiya where they visited Munira Ashgar Gallery. Mrs. Al-Ashgar, the wife of retired former Saudi Aramco Senior Vice President, Saud Al-Ashgar, has created a wonderful museum on the grounds of her home consisting of Saudi Arabian artifacts that she has been collecting for thirty years. She started her collection with an old wooden bowl her mother-in-law gave her soon after her marriage. She has acquired museum pieces from around Saudi Arabia and the world. Munira is very involved in community projects raising money for the poor and under-privileged. Professional photographer, Phyllis Tuner-Williams gave each guest a packet of postal cards she has designed; “Hands of Arabia”. Phyllis donates many photographs to Munira’s community projects for fund raising. Munira and her lovely daughters provided an assortment of Arabic appetizers, Arabic coffee and tea for the IIE delegation. 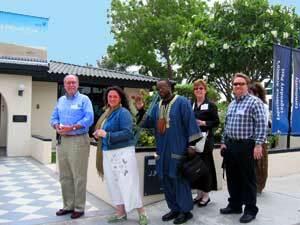 From the Gallery, guests were taken to Saudi Aramco's Community Heritage Gallery. 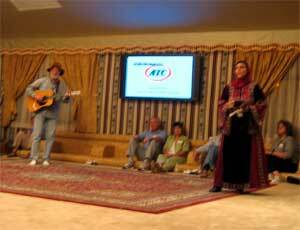 In late 2004 the Heritage Gallery began an exhibit on Traditional Bedouin Life and Desert Lore. The exhibit has been hugely popular. For the exhibit opening the Heritage Gallery’s front courtyard was filled with sand, and two tents were erected housing Bedouin practitioners and craftspeople demonstrating bread making, weaving, coffee preparation, henna adornment, falconry and other traditional nomadic arts. Outside the tents were camels, sheep and a horse. Inside the Gallery were displays on such topics as folklore, traditional fashion, arts and crafts, camels and horses, diet, housing and medicines. 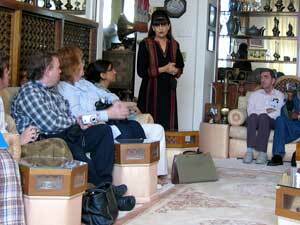 Tina Pakka gave us a wonderful tour of the museum explaining the traditional Bedouin family, culture and lifestyle.